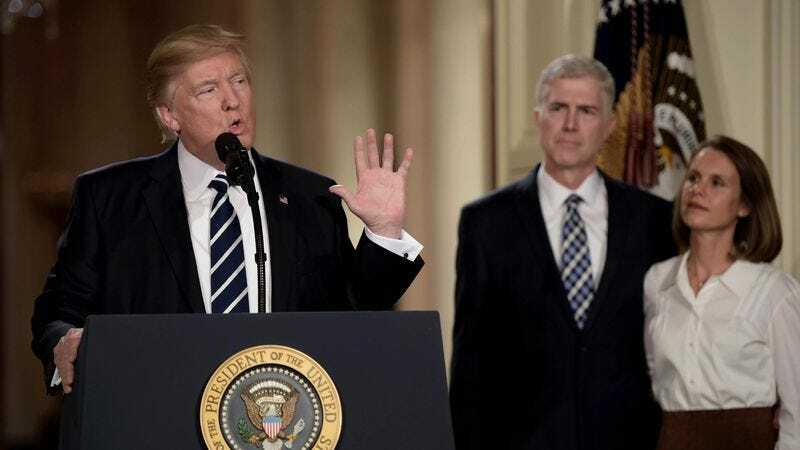 WASHINGTON—Praising the federal appellate judge’s commitment to upholding the Constitution, President Trump hailed his Supreme Court justice nominee Neil Gorsuch as a fierce protector of the future amendment that will allow the president to temporarily suspend the right to assemble. “I am confident that Judge Gorsuch will do everything in his power to see that every line of the Constitution, including the forthcoming amendment to grant the executive branch the power to halt all public protests, will be safeguarded as the law of the land,” said Trump, adding that Gorsuch’s strict adherence to the country’s supreme law, both in its present and very near future iterations, was what drew him to the 49-year-old judge in the first place. “If his track record is any indication, Judge Gorsuch will act as a stalwart defender of our nation’s founding legal document, which will soon contain a 28th amendment granting the president sole authority to restrict the public’s ability to collectively air grievances. He has my full vote of confidence in these matters.” Trump went on to say, however, that Gorsuch was also practical enough to know when certain parts of the Constitution didn’t need to be taken quite so seriously.